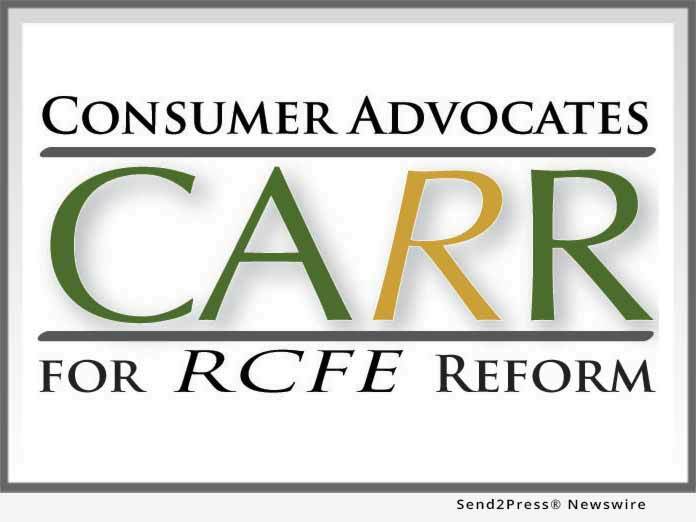 SAN DIEGO, Calif. /California Newswire/ — Consumer Advocates for RCFE Reform (CARR) announces its collaboration and partnership with California State Senator Anthony Portantino (D, SD 25) in the drafting of Senate Bill 172 Firearms, enhancing safe storage protections for the two most vulnerable populations in our society: the elderly and children. Testimony on the bill was received by the Senate Committee on Public Safety during a hearing on 2 April. The bill moved out of committee with a 6-0 vote (Morrell abstaining); it now moves to Senate Appropriations before being sent to the Assembly. CARR partnered with Senator Portantino’s office to draft the bill’s provisions requiring secure firearm storage in assisted living facilities – the Keep Our Seniors Safe Act. An estimated 70 percent of assisted living residents are diagnosed with Alzheimer’s Disease or related dementias, yet California law neither defines nor mandates safe storage of firearms, ammunition or other dangerous weapons in assisted living facilities. The state’s regulatory agency, Department of Social Services, Community Care Licensing Division, also does not track the number of facilities allowing firearms. If enacted, this legislation would close these statutory gaps. SB 172 also expands California’s existing Child Access Prevention (CAP) laws creates new crimes for failures to properly secure firearms. CAP laws have been shown to be effective at reducing suicides and unintentional firearm deaths and injuries of children, citing a study of twelve states’ where unintentional firearms deaths fell by 23 percent.